James Pritchard kicks for Bedford. 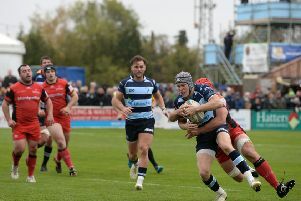 James Pritchard believes confidence is returning to the Bedford Blues squad after Saturday’s 41-40 victory over Cornish Pirates in the British and Irish Cup. Despite the bonus point victory, the Blues are now out of the cup competition after results in other pools went against Mike Rayer’s side. Yet the strong performance and victory comes just three weeks after Bedford lost 65-14 to Pirates in the championship, something that Pritchard is pleased to put to bed. ‘We wanted to get a good result today, especially after the performance we put in down there in the Championship. ‘We know it wasn’t pretty at times today (Saturday), but we showed good resilience in grinding out a win right up until the death. In a match where the lead exchanged hands eight times, the Canadian international scored 21 points as Bedford continued to show their attacking quality by scoring over 40 points for the second match in a row. Tries from Dean Adamson, Pat Tapley, two from Paul Tupai and Pritchard himself helped secure victory, and the Blues’ full-back believes it is down to confidence levels increasing for their upturn in point scoring. ‘We know we can play, and what is most pleasing is that our willingness to show that is returning, that comes down to our confidence returning. ‘The first half we threw the ball around and it worked, but the second half that part of our game didn’t go our way as we would have liked but we showed other aspects of our game. Pritchard, who featured for Canada on their international tour in November, is part of a squad that is slowly returning to full strength, something that he believes is good for all involved.